Gustav Mahler's "The Song of the Earth" in an exciting live atmosphere of concerts in January 2018 with Magdalena Kožená, Stuart Skelton and the Symphonieorchester des Bayerischen Rundfunks conducted by Sir Simon Rattle. The formal design of the work is unique, and the demands it places on its performers are extreme. It requires two highly experienced Lied singers, who in combination with the huge orchestral apparatus have to be able to perform as soloists while blending into the symphonic structure as concert voices. An excellent and well-coordinated body of sound is needed here, and of course a highly competent conductor to ensure cohesion and to give spirit and soulfulness to such a large-scale work. All these parameters were in place at the concerts recorded in Munich’s Herkulessaal on January 25 and 26, 2018, which have now already been released on the BR-KLASSIK label. The two outstanding soloists Magdalena Kožená and Stuart Skelton delivered the best possible Lied expertise, and Sir Simon Rattle, at the helm of the Symphonieorchester des Bayerischen Rundfunks, guaranteed unique sonority as well as creative symphonic cohesion. 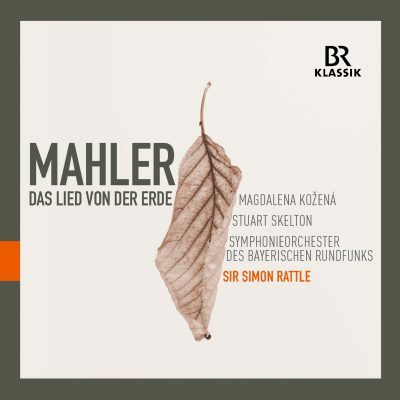 Mahler’s “Song of the Earth”, the Munich concert event of January 2018, has been documented on CD – a star-studded and outstanding interpretation of one of the most important compositions of the Late Romantic repertoire.